However, something very interesting should be taken into account regarding the timing of this event. 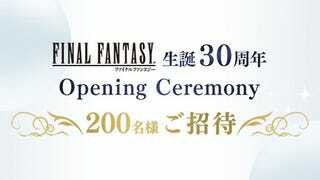 The date of the opening ceremony, which is when they plan to make all these announcements, is 20 years to the day that Final Fantasy VII released in Japan: January 31st, 1997. Why pick this day? Well the answer should be obvious. If you recall the above rumor stated that as part of the 30th anniversary plans Final Fantasy VII Remake Part I would be released before the years end. The date of the opening ceremony is significant because 2017 is Final Fantasy VII’s 20th anniversary and VII Remake has been in development in some form for the past three years based on developer comments. It’s not hard to believe that VII Remake Part I is fast approaching the finish line thanks in no small part to Unreal Engine 4 and the assistance of CyberConnect2. It makes complete sense to announce the release date, if not at least the release window, for the remake on the anniversary of the original game. And while that may be speculation based on the rumor, the event itself is real, so if you’re a fan of the franchise you should definitely keep that date marked on your calendar and be prepared for whatever Square Enix announces.